The whole chicken-and-egg question of making a film set in Hiroshima is something that has to be addressed right away. There is no escaping the fact that if you set a film in that city – certainly in the 1950s, at any rate – then you will have to stare at the atomic bomb. But then, why set a film there if you do not intend to utilise it? Alain Resnais’ problem, however, was that he had already made a documentary about the Second World War, the acclaimed Night And Fog, a mere five years previously. He had apparently found that the subject matter of the Holocaust made the film-making process a traumatic one and he did not want to repeat it with Hiroshima after he was approached about the possibility of making a film on that theme. He decided, instead, to hang the film around a nameless couple who are having an affair in the city in 1959. Both are married – how very French – and both, it transpires, suffered during the war. He (Eiji Okada) remains a cipher. We know that he was a soldier in the Japanese army, that he lost his family during the atomic attack, and that he is an architect. Beyond that there is little that is revealed. His house is packed with books; he is a curious man. She (Emmanuelle Riva), on the other hand, has her past shown to us in brief flashback episodes as he gets her to open up. One of the few flaws in the film is that, while Riva is the correct age for the actress in 1959, she is far too mature for the teenage girl who fell for a German soldier (Bernard Fresson) in occupied France. The German soldier dies – it is the first thing that we learn about him, even before his nationality and relationship are established, and it is this event that traumatises and then moulds the actress. And an actress is what she has become. She is taking part in a film about peace. Tomorrow is her last day of filming and she will be flying home, so they meet for the first time in a bar and go to her hotel room. She is merely looking for an emotion-free encounter, but he can’t accept that he will never see her again and so goes to the film set. As the hours unfold, she gradually reveals her past to him. But there is a peace march, a joy-filled celebration of humanity, which they first have to push through to stay together. At times it is unclear whether the parade is part of her film or not, but if it is then her film is certainly a proto-new wave film. A few extras, still made up as burnt survivors, are amongst the crowds who watch the parade. A sign states that an atomic bomb is 20,000 times more powerful than a conventional bomb, and it is followed in this carefully choreographed display by one that states that an H-bomb is 20,000 times more powerful than an atomic bomb. And so on. The numbers are inconceivable, so what Resnais has done is to examine the effect that the loss of her German lover had on the actress. He has, in a manner of speaking, examined the horror of war on an atomic scale. Each individual death is a tragedy. 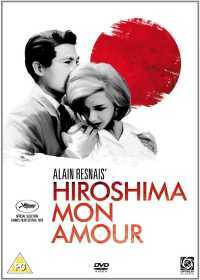 In retrospect it is unlikely that the actress’ film is proto-new wave for the very simple reason that Hiroshima mon amour invented the movement. You may argue the point, but it was certainly there within months of Truffaut and Chabrol’s opening moves. The first quarter-of-an-hour is like nothing that had been seen before. The perfect skin of the lovers is shown, intertwined, glistening and dusted with silver, in brief glimpses while the camera tracks through Hiroshima, examining the museum, Peace Square, the ruined observatory and moving on to the horror-show of the filmed recreations that are shown in the museum. Over all of it is her description of what she has seen and his repeated replies that she has seen nothing, remembered nothing. It is hypnotic and moving stuff. Nothing else in the film rises to this intensity, but then it doesn’t need to. There is a brief scene when he slaps her, twice, in a late-night cafe, as she starts to lose herself to hysteria. It is shocking now and, judging by the looks of the other diners, it was shocking then. Whatever Resnais’ intention was, it sets alarms ringing. We remember that he was a soldier in the brutal Imperial Japanese Army and now feel that it would be a grave mistake for her to remain with him. Was this what Resnais wanted us to feel? I doubt it. It is possible that he was attempting to show us that there will always be the possibility of conflict in our future and we must remain on our guard, but a few seconds of footage on the cutting-room floor would have removed this ambiguity. The other possibility, that Resnais thought this acceptable behaviour under the circumstances, is too ugly. Another, less puzzling, anomaly is her walk through the empty streets of the neon-lit modernist Hiroshima, which is inter-cut with daylight shots of a grey, ghostlike, medieval Nevers. A Hiroshima with a bustling nightlife would have eroded the power of Resnais’ vision. Such things are allowed for the sake of the film. This DVD is French language with English subtitles. No extra features are included.